Imagine a place where the silence is so deafening that you can hear your heartbeat or the wind rushing through a raven's wings. Imagine a place where the air carries the sweet fragrance of blooming mountain mahogany and wet sagebrush after a passing thunderstorm. Imagine standing next to a 700-foot granite tower, eyes straining to see a soaring golden eagle flying circles around the summit. 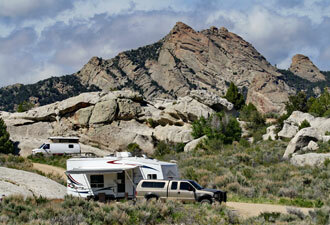 Such a place exists in southern Idaho's Albion Mountains—City of Rocks. In 1988, Congress created the 14,407-acre reserve, managed in partnership with the Idaho Department of Parks and Recreation. Composed of federal lands, state park lands, and private property, City of Rocks protects a relatively untouched landscape surrounding 6.2 miles of the California National Historic Trail. The reserve features grand geologic scenery that awed westward emigrants between 1843 and 1882. Travelers today can retrace wagon ruts, see signatures written in axel grease on the pinnacles near where emigrants camped, and read journal accounts that connect us to this same sense of place. After all the hardship that emigrants had thus far experienced, City of Rocks offered a refreshing reprieve, a place of inspiration, and renewal of hope. 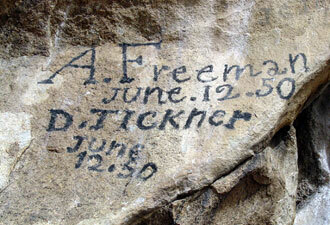 City of Rocks is still such a place today. Experience what it was like to camp in the shadow and shelter of granite monoliths in one of the reserve's 64 campsites. Strike out on one of more than 22 miles of trails to rediscover sculpted arches, windows, and giant panholes of water. Scramble upon the smooth-white outcrops, or better yet, strap into a harness, enlist a belay, and climb on to one of the reserve's 700 sport and technical rock climbing routes. City of Rocks is world renowned for its superb granite faces. Park staff offer a Climbing Experience Program for those who want to taste the experience. A visit in June or September is best, but it's also the most crowded. Temperatures during these months range from a high of 80 degrees to cool evenings in the upper 40s. Most of the reserve's moisture falls as snow in the winter months, but the afternoon thunderstorms of summer can bring cool air and new life to the high desert. Some of the reserve's showy flowers include sagebrush bluebells, western columbine, arrowleaf balsamroot, and silver lupine. The locally-rare Simpson's hedgehog cactus blooms excite the field botanist and photographer alike. Idaho's only pinyon pine woodland is found here; and early September brings ripe pine nuts for the tasting. The wildlife enthusiast can track mule deer, mountain lion and moose, as well as the smaller creatures such as Idaho's rare cliff chipmunk, ringtail, or mountain cottontail. Birding here is superb. 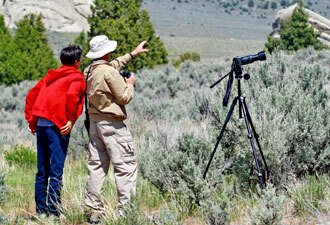 Watch for such Idaho rarities as pinyon jay, Virginia's warbler, juniper titmouse, and nearly 20 species of raptors and owls. City of Rocks National Reserve, located about halfway between Salt Lake City and Boise, Idaho, is sure to surprise the first-time visitor with its grand scenery and westward emigrant history and is guaranteed to inspire returning visits. Come discover why two-thirds of all reserve visitors have made City of Rocks their primary vacation destination.